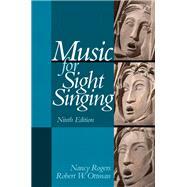 by Rogers, Nancy; Ottman, Robert W.
The most engaging and musical Sight-Singing text on the market. Music for Sight Singing is structured around organized melodiesdrawn from the literature of composed music and a wide range of the world’s folk music. Real music exercises allow readers to practice sight singing and develop their “mind’s ear” – the ability to imagine how music sounds without first playing it on an instrument. The ninth edition continues to introduce a host of important musical considerations beyond pitch and rhythm- including dynamics, accents, articulations, slurs, repeat signs, and tempo markings. The book’s arrangement of simple to complex exercises lays the foundations for success. Fluently read rhythms in simple and compound meters, including those in relatively unusual, irregular, or changing meter signatures. Sight sing melodies in any major or minor key, and in any diatonic mode. Effortlessly read all four common clefs. Understand common musical symbols and terms. Recognize and sing important harmonic features such as dominant seventh and Neapolitan chords. Improvise effectively from a variety of background structures such as a harmonic progression or an underlying contrapuntal framework. Negotiate chromatic passages from simple embellishing tones and tonicizations to modulations to post-tonal music. Nancy Rogers is an Associate Professor of Music Theory at Florida State University. With research interests including music cognition and its pedagogical implications, Dr. Rogers has presented papers at national and international conferences, including meetings of the Society for Music Theory, the Society for Music Perception and Cognition, the International Conference on Music Perception and Cognition, and the Conference on Interdisciplinary Musicology. She was a keynote speaker at the 2009 Musical Ear conference held at Indiana University. Several recent publications may be found in Music Theory Online, the Journal of Music Theory Pedagogy, and Em Pauta. Professor Rogers received her Ph.D. in music theory from the Eastman School of Music; she is a Mellon Fellow in the Humanities. She has served as President of Music Theory Southeast, Secretary of the Society for Music Theory, and Treasurer of Music Theory Midwest. Before coming to Florida State University, she served on the faculties of Northwestern University, the University of Iowa, and Lawrence University. Section 1 (R). The quarter note as the beat unit. Beat-note values and larger only. Section 2 (R). The quarter note as the beat unit and its division. Dotted notes and tied notes. Section 3 (R). Two-part drills. Section 4 (R). Note values other than the quarter note as beat values. Section 5 (R). Two-part drills. Section 1. Major keys, treble clef, the quarter note as the beat unit. Key signatures with no more than three sharps or three flats. Section 3. Other meter signatures. Section 1. Major keys, treble clef, leaps of a third, fourth, fifth, and octave within the tonic triad. The quarter note as the beat unit. Section 3. Leaps of a sixth within the tonic triad. Section 4. The half note and the eighth note as beat units. Section 6. Key signatures with five, six, and seven sharps or flats. Section 1 (R). Rhythmic reading: The dotted quarter note as the beat unit. Single lines and two-part drills. Section 2. Sight singing: Major keys, treble clef; the dotted quarter note as the beat Unit. Section 3. Sight singing: Bass clef. Section 4 (R). Rhythmic reading: The dotted half note and the dotted eighth note as beat units, including two-part drills. Section 5. Sight singing: The dotted half note and dotted eighth note as beat units. Section 1. Leaps of a third within the V triad; major keys; simple meters. Section 2. Leaps of a third within the V triad; minor keys; simple meters. Section 3. Leaps of a fourth and fifth within the V triad; major and minor keys; simple meters. Section 4. Leaps of a sixth within the V triad; simple meters. Section 5. Compound meters; various leaps within the V triad. Section 6. Numerator of 3, compound meters. Section 1. The alto clef. Section 2. The tenor clef. Section 4. Additional practice in the C clefs. Section 1. The complete dominant seventh chord. Section 2. The leap of a minor seventh within the V7 chord. Section 3. The leap of a tritone within the V7 chord. Section 4. Other diatonic seventh leaps. Section 1 (R). Preliminary exercises, simple meters. Section 2 (R). Rhythmic reading exercises in simple meters. Section 3 (R). Two-part drills, simple meters. Section 4. Preliminary exercises, compound meters. Section 5. Rhythmic reading exercises in compound meters. Section 6. Two-part drills, compound meters. Section 1. Single-line melodies and duets. Section 1. Diatonic leaps except the seventh and tritone. Section 2. Leaps of a seventh or tritone within the V7 chord. Section 3. Other melodic dissonances. Section 1 (R). Syncopation in simple meters at the beat or beat division level. Section 2 (R) Syncopation in compound meters at the beat or beat division level. Section 4 (R). Syncopation at the beat subdivision level in simple meters. Section 5 (R). Syncopation at the beat subdivision level in compound meters. Section 6 (R). Two-part drills. Section 7. Syncopation in simple meters at the beat or beat division level. Section 8. Syncopation in compound meters at the beat or beat division level. Section 9. Syncopation at the beat subdivision level in simple and compound meters. Section 1 (R). Triplet division of undotted note values. Section 2 (R). Duplet division of dotted note values. Section 4. Triplet division of undotted note values. Section 5. Duplet division of dotted note values. Section 1. Chromatic notes in the context of stepwise motion. Section 2. Chromatic notes approached or left by leap. Section 3. Tonicization of V in major keys. Section 4. Tonicization of III and modulation to the relative major from minor keys. Section 5. Modulation to the dominant from major and minor keys. Section 1. Tonicization of any diatonic triad; modulation only to the dominant or relative major key. Section 2. Modulation to any closely related key. Section 1 (R). Definitions and rhythmic reading exercises. Section 2. Changing meter signatures. Section 4. Meters of 5 and 7, and other meters. Section 1 (R). Rhythmic reading. Section 1. Chromatic tones in less common intervals. Section 2. The Neapolitan sixth. Section 1 (R). Meter and rhythm. Rhythmic reading. Section 2. Extensions of the traditional tonal system. Section 3. Symmetrical collections; the whole-tone and octatonic scales. Section 4. Freely post-tonal melodies; twelve-tone melodies. Music for Sight Singing: 5 out of 5 stars based on 1 user reviews.